Melissa Made: Floating by to say hi! Floating by to say hi! Hi ya everyone! I'm back with a new creation using an adorable Tiddly Inks image called Floating By Clear Stamp set. I did something a little different and used some cold press water color paper and painted some water colors from Koi to create a watery scene. I then colored up this adorable image in Copics and popped her off the back of my card. The sentiments are included in this set. I added a touch of stardust stickles. The challenge at Tiddly Inks this week is Clean and Simple! So hard for me!! Check out the other team members and enter for your chance to win a digital gift certificate or be featured on Fabulous Inky Friday! oh my, this is mixed media gorgeousness, I love the watery background,if I tried that it would look like spilt coffee...!!!!! 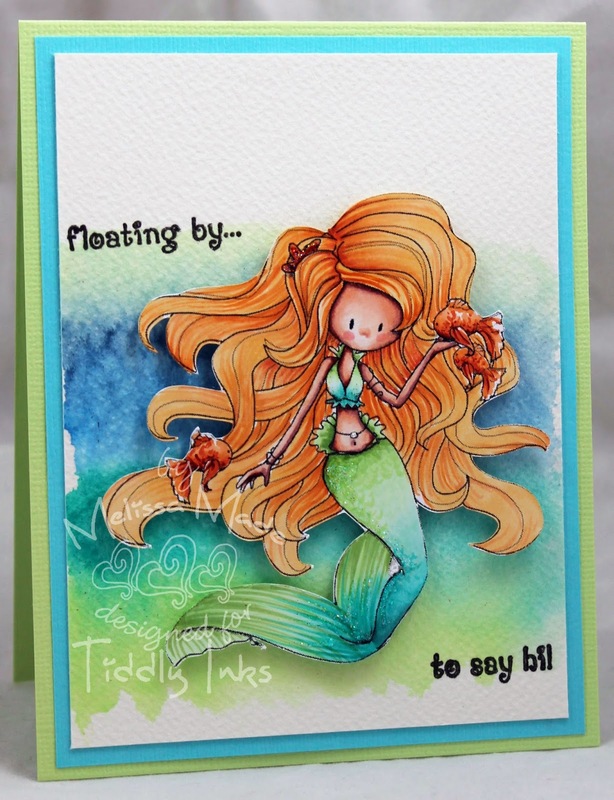 Hello Melissa, oh wow that watercoloured background is perfect for this image - stunning work!